Where are the missing mystics of the revolution? Mysticism can undermine the social and political order in fundamental ways. 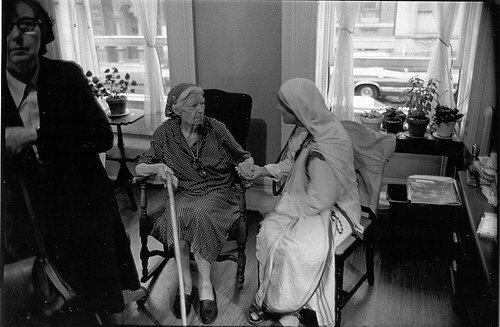 Dorothy Day and Mother Teresa at the Maryhouse office in New York City on June 17, 1979. Credit: Bill Barrett/ http://www.onbeing.org. Hermits in caves or yogis on mountaintops: that’s how mystics are usually depicted. What could be further from the transformation of society? But what if mysticism was crucial to successful interaction, a missing ingredient in struggles for social change? By definition, mysticism requires ‘direct contact with the divine,’ but not necessarily a withdrawal from the world. And the mystics we’ve been studying have ‘found the divine’ not in solitary prayer and contemplation but through their interactions with other people. What is it that makes mysticism socially important? In their newspaper, they recommended organizing one’s life around the Corporal Works of Mercy, and stressed the meaning of personal responsibility for the poor—arguing that people should live in community in poor neighborhoods and give hospitality to the homeless in Catholic Worker houses. The Catholic Workers believed that engaging the world by serving the poor created an opportunity to live both emotionally and spiritually closer to God. Second, living in equality cultivates shared experience with, rather than pity for, the poor—a sense that ‘we are all in the same boat.’ A commitment to poverty offered the potential for shared perspectives to develop across strict social divides. Both Mother Theresa and Dorothy Day were deeply, personally religious, but they served anyone who asked for their support, regardless of their faith or lack of it. In their published papers, both women wrote that they experienced Jesus directly in serving the poor. This is not to say that all of their interactions were mystical, but rather that the capacity to generate mystical experience through working with others was important in sustaining their activities. This capacity kept them motivated and emotionally buoyed up while doing such demanding work over the long course of a lifetime. The sociologist Randall Collins argues that people are motivated by emotional energy, which manifests in feelings like confidence and enthusiasm. When social interactions go well, all those involved increase their emotional energy. But in order for this to happen, such interactions need to have what Collins describes as a “shared mood, bodily co-presence, and a shared focus of attention.” When these conditions are not present, people actually lose emotional energy—as when they are positioned as the less powerful person in a power-based interaction. The sense of ‘shared mood’ that social mystics cultivate is particularly important in social action, because so many conventional ‘helping’ relationships are distant and unequal. So they tend to become interactions in which emotional energy is siphoned away from less powerful people by the more powerful. But face-to-face interactions motivated by shared experience can generate emotional energy for everyone involved. That’s because—despite differences in status—they are grounded in a sense of unity and equality which are characteristic of mystical experience. Both women emphasized prolonged contact with the poor, and sometimes quite intimate bodily care that ranged from attending to seeping wounds to washing the damaged feet of homeless people. Neither of them lost this sense of ‘co-presence’ as their work expanded—a critical aspect of solidarity-building relationships. Hence, by doing their work in a very particular way, both women fulfilled the requirements laid out by Collins for successful solidarity-building interactions. In turn, this increased the potential to generate shared emotional energy across divisive social lines. As these examples show, social mysticism can shift the ways in which people interact with one another by providing opportunities for solidarity to develop in the face of profound differences in power and resources. In such interactions, a sense of self-worth, dignity and equality is cultivated in and between those who are served and those who are serving them. These relationships upend the typical order of things—the hierarchies that characterize human interactions even when they are supposed to be aimed at social change. Because it imbues human relationships with the power of the divine, social mysticism generates great potential for change and creativity. It supports the formation of new perspectives, builds communities that embody them, and nurtures a particular style of interaction that’s capable of doing something quite profound: redistributing emotional energy from those who have more resources to those who have less. In these ways, mysticism can play a crucial role in creating critiques and sustaining active resistance to the prevailing social order. Social mysticism is a seed that can grow to a much larger scale through communities that live out their commitment to work in solidarity with one another. Day did this through the Catholic Worker movement, and Mother Theresa through the Missionaries of Charity. Both demonstrate how mystical practices that engage with the world can create meaningful social change on the foundation of face-to-face interaction. To the extent that opportunities for these interactions are spread through larger communities, social mysticism has the potential to undermine the wider social order in truly radical ways. Those who are used to looking up to see if collective action is successful should also look out and in to understand the power of change that’s inherent in mystical experience.